We have highlighted the green shoots globally for a while now and at some point, one must put the money where the mouth is. Hence, we go long EUR/USD, as we judge that an Asian rebound is better news for EUR than USD. Admittedly that headline is a bit stretched compared to our long-long-term view on the EUR (to say it the least), but hey… Its spring-time and green shoots are all around us. So, let’s start with some thoughts on the budding green shoots / Devil’s advocate narrative. 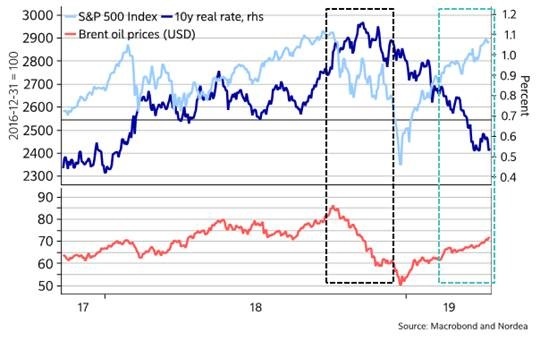 The combination of a triple-dovish Fed (QT, rates, inflation overshooting) as well as the rise in oil prices has prompted a substantial drop in US real rates. US real rates have in turn been a leading indicator not only of the S&P500 index. US real rates currently signal some more upside in risky assets going into May. 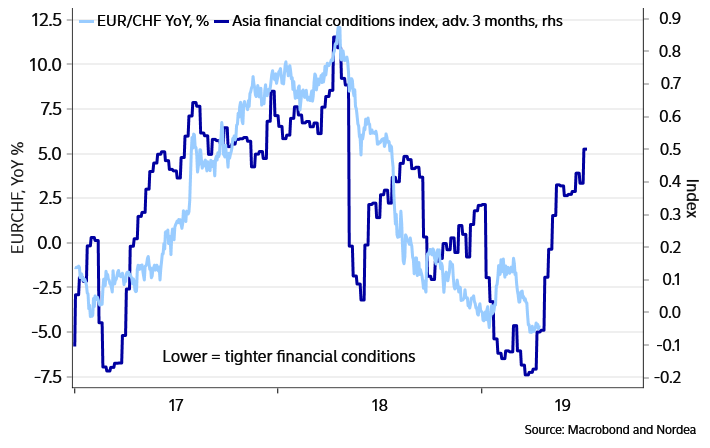 The drop in US real rates have also helped beget more expansionary financial conditions in EM Asia, easier conditions which predicted the March upturn in several Asian PMI figures – green shoots! 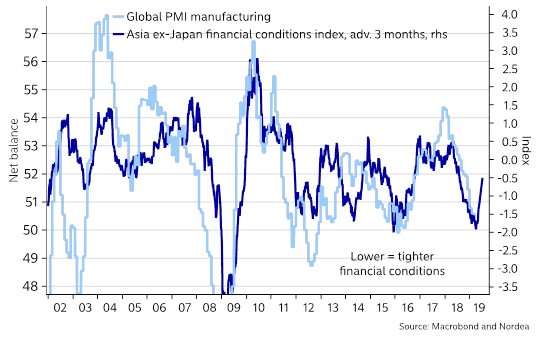 Indeed, Asian financial conditions have kept improving in recent weeks, which suggests that the global PMI could improve this summer. These improvements are not fully corroborated by global liquidity measures, but perhaps that can be alright? 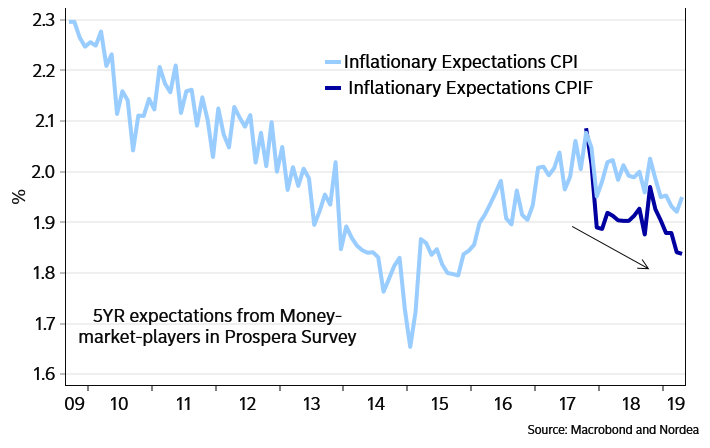 For instance, if the Chinese government unveils new fiscal measures, as it has done, does it not make sense for business sentiment to rise even before the effects show up in monetary or hard data? Moreover, given that market participants have been very fearful of Quantitative Tightening (remember Q4, 2018? ), does it not make sense that market participants are less fearful already today? We think so. The upturn in Chinese monetary growth in March offers psychological support for the green shoots narrative. Alas, a fair chunk of the positive news outlined above ought however to be largely priced-in by now, at least in equities. And now one can perhaps question the near-term direction for oil prices. US real rates were boosted by Fed’s Powell (“may go past neutral”) and falling oil prices in October/Q4, but have been dragged down by both this year. One tinfoil-hat hypothesis would be that Saudi Arabia has perhaps cut back oil production this year so as to boost appetite for Aramco’s bonds, bonds which they issued for the first time in April. If this is true (#fintwit seems to believe as much), then perhaps the Saudis could boost production again. This could augur lower oil prices and therefore push US real rates higher – which would then start to weigh on risk appetite once more. One thing missing in the green shoots story is EM FX performance. Back in 2016 when the Fed eventually went on hold, EM FX fared better than it has done this year – despite this year being a much better year for equities. It could be that this difference reflecting relative growth. As of 2018Q4, US growth was outperforming the rest of the world at its strongest pace since summer of 2015. And relative growth can be a leading indicator of the USD. 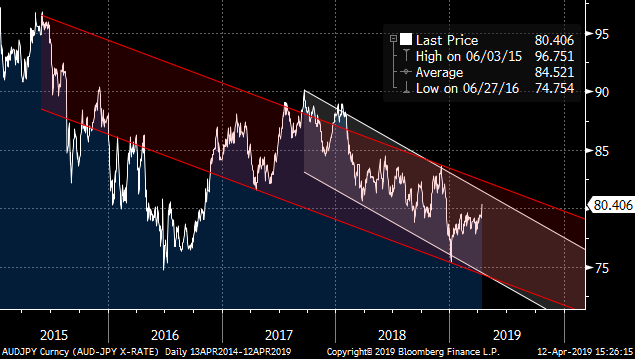 What could help EM FX and more materially dent the USD would be if RoW growth finally starts to pick up vs US growth, and thus start to close the US’ outperformance gap. Chinese stimulus, improving global trade, currency tailwinds for Europe, could help that unfold in coming quarters. It is important how the US’ outperformance gap closes, if US growth crashes, it could still be good news for the USD because of the dollar smile, but the US has remained resilient – and perhaps Trump’s deregulation will keep it so. The green shoot narrative is therefore probably also supportive of a bounce in EUR/USD, but so far, we have only opted to highlight that scenario, but refrained from entering long EUR/USD. 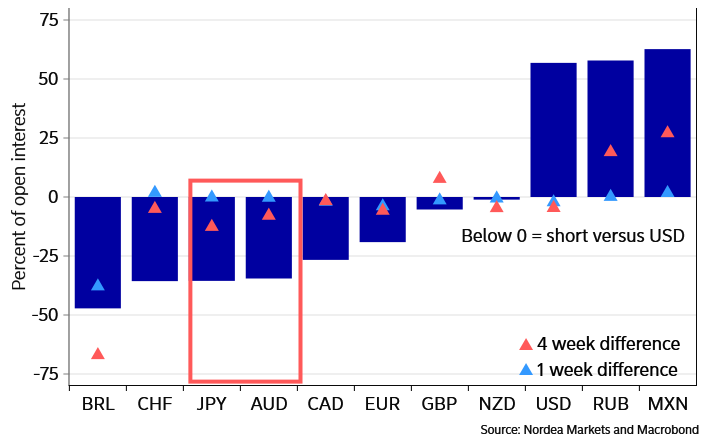 The smart way to play a long EUR/USD position is maybe via short CAD/NOK (those positions are highly correlated historically), as a short CAD/NOK works roughly as a long EUR/USD position, but with a shield from the expensive carry (of shorting USD versus EUR). At some point one though must put the money where the mouth is and hence we go long EUR/USD. Target @ 1.1650. Consider a stop/loss @ 1.1187. 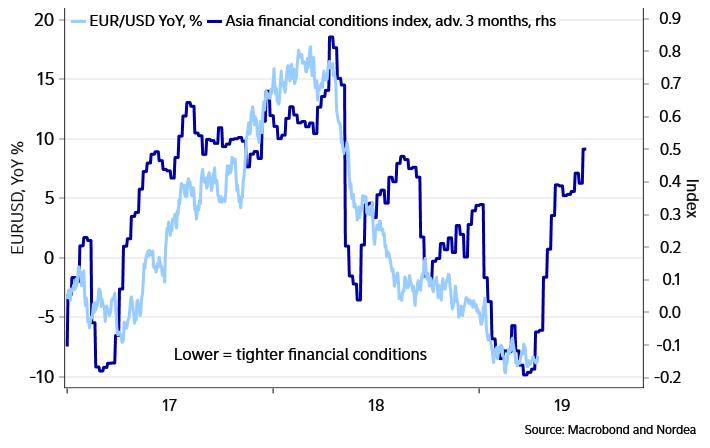 Another way to play the EUR positive bet could be against the CHF, as a potential stabilization in Euro area key figures (even at low levels) should limit the appetite for Euro area doom and gloom hedges in CHF. Positioning wise both JPY and CHF are though already out of fashion among investors. Chart 7: EUR/CHF could also rise, if the green shoots narrative has got legs. 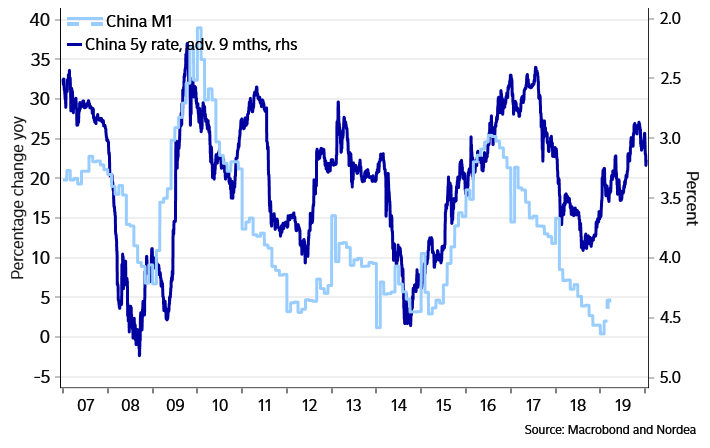 We have earlier argued how a stabilization of Euro area PMIs is a prerequisite for the EUR/USD rebound, and therefore those of a very short-term persuasion may decide to wait until after the April PMI release on Thursday to buy EUR/USD. Our month/month PMI model is still not hinting a bounce (yet). Chart 8: Euro area PMI may not rebound in April, but we still expect a stabilization in 1-2 months..
Has the Riksbank shifted hawkishly or not? Before 2013, the Riksbank did what the unemployment rate told it to. It was hiking rates when the labour market tightened, and vice versa. This pattern broke down in 2013 – a shift which can be blamed on the SFSA being named the macroprudential authority (leaving Riksbank with focusing on inflation), and on the de-anchoring of inflation expectations at the time. When we measure what the Riksbank talks about in its meetings (grey line), we find that it shifted focus in late 2013 to focus more on inflation and the currency than before. 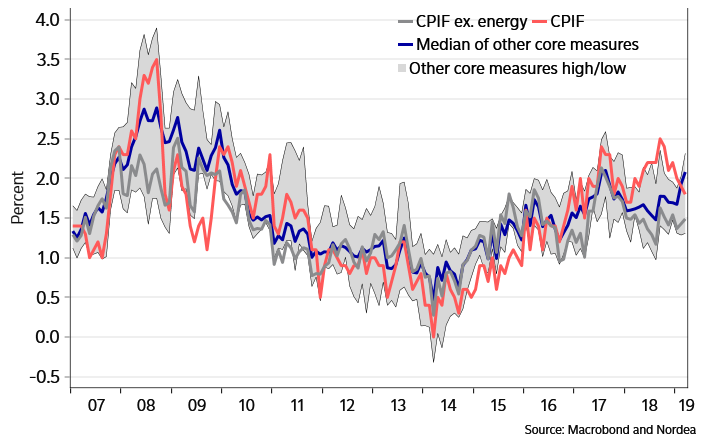 However, as of the February meeting a new shift looks to have occurred – the Riksbank talked less about inflation than in the 2014-2018 period. 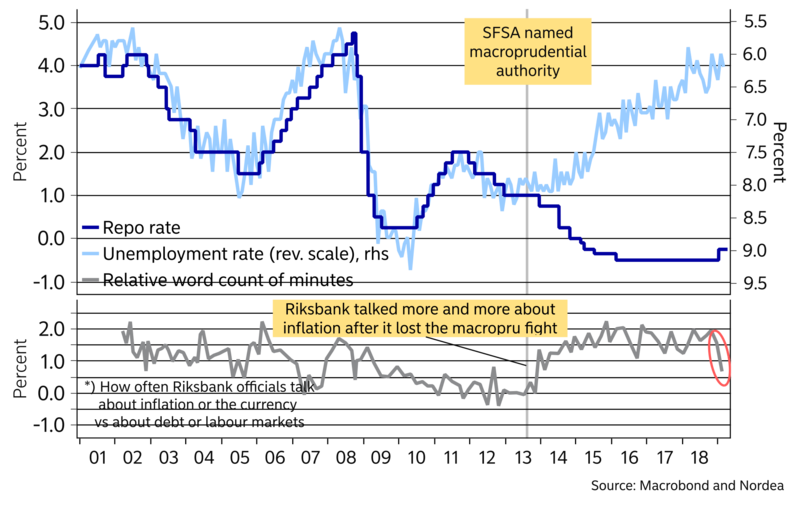 While this was likely driven by the absence of dove Jansson, this shift fits with the perception that the Riksbank has become more hawkish recently. Why else would the three Riksbank musketeers (Flodén, Skingsley and Ohlsson) tend to downplay recent inflation disappointments while also expressing surprise about the weak SEK (comments seen as mild verbal intervention)? In October 2018, the Riksbank wrote “[f]or inflation to remain close to the target in a lasting manner, measures of core inflation also need to be close to 2 per cent” and here we note that despite the recent inflation disappointments, the median of measures of underlying inflation has been accelerating, from 1.5% in August last year, to 1.7%, 1.9% and 2.1% in 2019 (chart 10). This uptrend in underlying inflation could support the more hawkish members of the the board. It used to be that by listening to Deputy Governor Jansson you could predict the Riksbank’s decisions well. Wherever Jansson went, the majority followed. Deputy Governor Jansson could easily be about to start worrying once more about deanchoring of inflation expectation, as e.g. 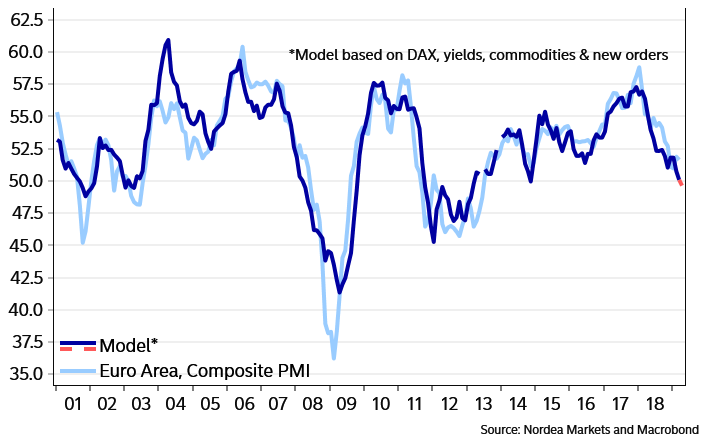 Prospera’s inflation expectations have been trending in the wrong direction (chart 11). However, Jansson dissented against the rate hike in December and may now be part of a dovish minority,perhaps leaving the three hawkish musketeers in command of the Riksbank’s monetary policy levers. If the Riksbank were to sound hawkish in April (not our forecast), the market will be in for a big surprise – as Riksbank would then be joining Norges Bank in its currently lonely camp of hawks. The outcome space for SEK is wide currently, why our best call right now is to be long volatility over the Riksbank meeting 24/25th of April. The market is now slowly starting to acknowledge that Norges Bank may opt to hike again in June, even reluctantly so. Ahead of the March hike the market also only slowly built up the hiking probability, and it seems as if history repeats itself ahead of June. 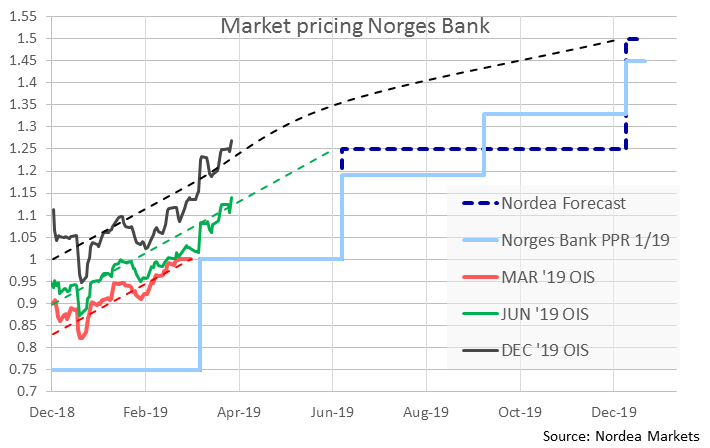 13-14 bps are now priced in to the NOK OIS curve ahead of June (slightly above 50% probability for a hike), which is almost in line with Norges Banks rate path. Hence, the scope for interest rate positive news for NOK is limited short-term. We have argued for a while to take profit in short EUR/NOK positions between 9.55-9.60 (which could also mean that the long NOK/SEK case is a little exhausted by now). We are also about to enter the Norwegian dividend season, which holds considerably larger dividend payments than in 2018 (47bn versus 35bn). In particular Friday the 10th of May is a day to watch, as DNB will distribute NOK 13.2 bn of dividends (NOK: Limited effect from higher dividends this year). The Swedish dividend season is already running. Read our FX weekly from a few weeks ago for a full schedule (FX weekly: There is a smell of 2016 in the air). The purest “Asian green shoots” bet is still a long AUD/NZD position and we continue to like the position even after the bounce to +1.06 territory. The main reasons are that i) Australia is more directly linked to the Chinese credit cycle than New Zealand, ii) RBA is/was priced to cut more than RBNZ and iii) positioning indicates that AUD is among the most hated G10 currencies, while NZD positioning is squarer versus USD. We would consider taking profit above 1.0670. Last week, RBNZs Orr sounded a little dizzy in his assessment of the monetary policy outlook. 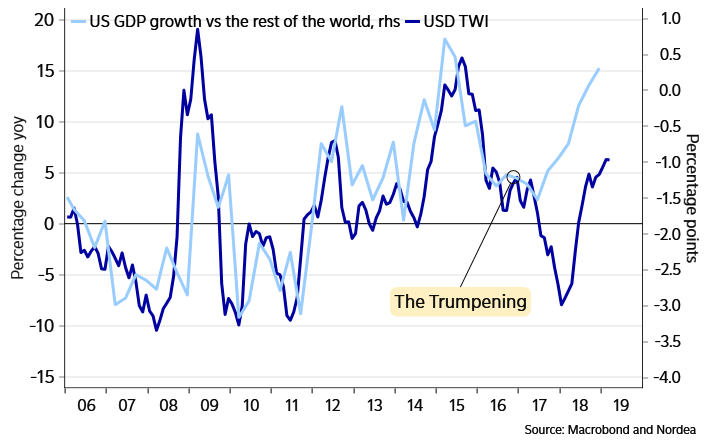 On one hand capacity utilization and terms of trade are almost record high, but on the other hand inflation is below target. “Is the world turning out slightly better?” asked Orr (much like the Riksbanks Flodén did in Sweden on Friday by the way). It is as if RBNZ and the Riksbank have read our “Asian green shoots” pieces. 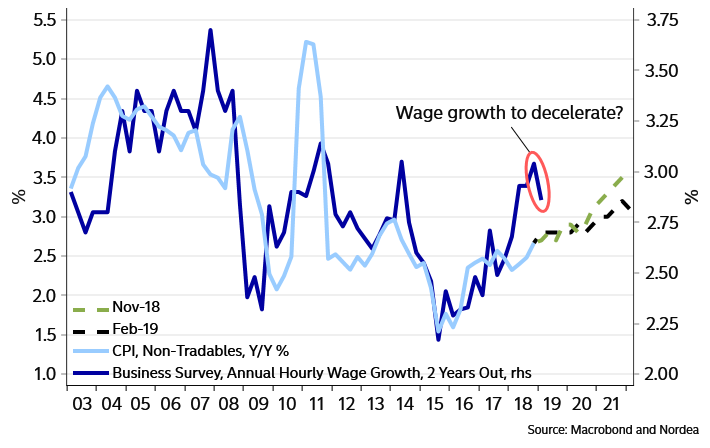 Orr and the yield curve apologists within RBNZ though still need to answer the big question; Why should non-tradables CPI start to accelerate now, when the wage growth surveys hint of decelerating wage pressures? Even with green shots in the Asian economy, New Zealand unemployment could start to tick up as a lagged effect of the global slowdown. We continue to dislike the NZD versus both EUR and AUD. Chart 13: Why should non-tradables inflation pick up now, when it almost didn’t in 2018? CFTC-data reveals that markets are still massively short the odd bedfellows JPY and AUD at the same time. At some point one of these short positions probably must give in and with green shoots in Asia, it may be that it is the AUD positioning that is most likely to be reversed. 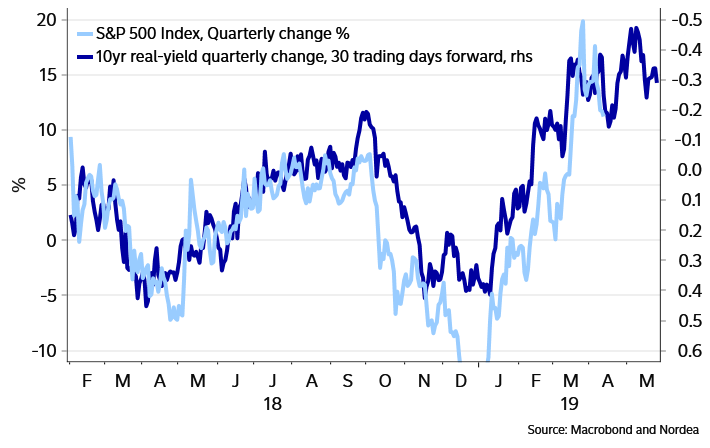 Those who really buy into our green shoots story may hence opt to go long AUD/JPY (we though refrain from doing it, as we still see risks from e.g. the short volatility positioning). Technically, we will get a big test of the recent AUD/JPY momentum around 81.50 (the downtrend from Sep-17). Unless AUD/JPY breaks that level on the topside, the structural downtrend seems intact.